I've fiddled with cacao nibs in the past, but never really found an application that works well. In ice cream and yogurt I find them too hard, like eating the shell of a nut. Other times they seem too bitter and unbalanced. I don't even really like them in chocolate bars, as they interrupt the smooth texture. 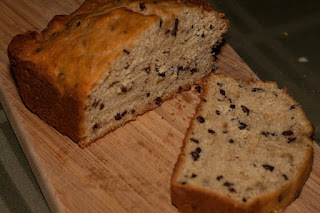 So I can't say why I decided to try them again, but when a friend said he tried banana bread with cacao nibs at a local specialty store, it seemed like a really smart idea. This is just a basic banana bread recipe from Mark Bittman's "How to Cook Everything." I've used it so many times, my copy opens automatically to the page, which is handy for finding a recipe in this 960 page monster. I just took out the walnuts and coconut, then added in 1/2 cup of crushed nibs. It really works well - the nibs become soft and tender in the moist dough, but still give a bit of nut-like resistance. The nibs also make the entire loaf taste like chocolate, but more in a rich, dark baking chocolate way than in a sweet chocolate chip kind of way. Plus the nibs don't melt, or burn on the bottom of the pan, making this a really tidy finger food.